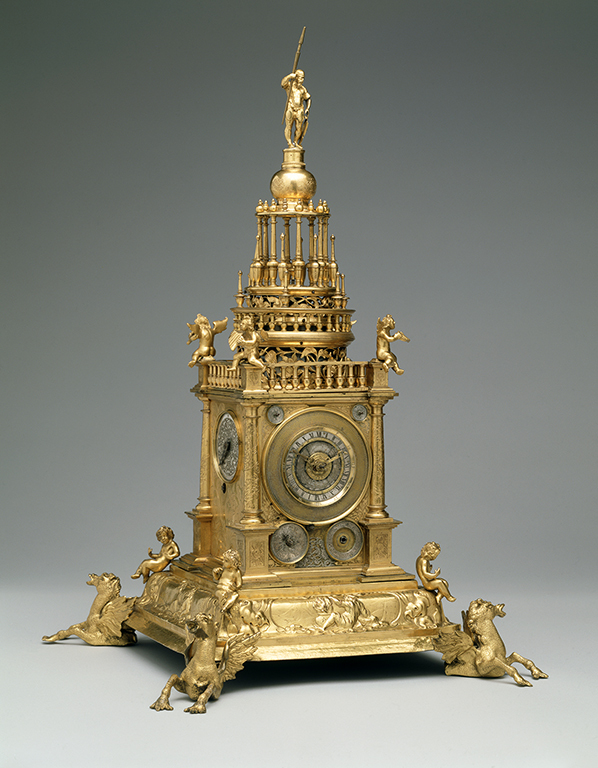 An exceptionally rare masterpiece, this monumental tower clock from the Flagg collection is one of the most important German Renaissance clocks in North America. It was likely Ludwig Hyrschöttel’s submission in 1658 for admission into the Augsburg clockmakers’ guild. As such, the clock meets all the rigorous technical standards required from the guild, for example, in its capacity to chime 1–12 twice and also 1–24. Twelve dials indicate the calendar year, days of the week, hours and quarter-hours, and the zodiac. The ornamentation of the case was less prescribed. Hyrschöttel chose to present his tower clock enriched with the opulent grandeur characteristic of mid-17th century German architecture. Klassik Uhren: Faszination Technik, Szene, Markt, Auktionen. Ulm: Ebner, 1994, September/Oktober 2014, fig. 5, 6, p. 40, b/w illus. Andera, Margaret, Nonie Gadsden, Britt Salvesen, and Laurie Winters. Collection Guide: Milwaukee Art Museum. Milwaukee, Wisconsin: Milwaukee Art Museum, 2004, pp. 11, 67, cat. 7, color illus. p. 11. Milwaukee Art Museum. Building a Masterpiece: Milwaukee Art Museum. New York: Hudson Hill Press, 2001, p. 67, color illus p. 42, 43, 67. Winters, Laurie et al. A Renaissance Treasury: The Flagg Collection of European Decorative Arts and Sculpture. New York: Hudson Hills Press, 1999, p. 41-43, cat. 10, color illus. p. 42. Maurice, Klaus. Die deutsche Räderuhr. Munich: Beck, 1976, vol. 2, p. 42, fig. 243. La Collection Spitzer: Antiquité, Moyen-Age, Renaissance. Paris: Quantin, 1892, vol. 5, p. 35, no. 1.